Open Beta for EverQuest II: Tears of Veeshan will open tomorrow, on Tuesday, October 15, 2013. This is a great chance for players to check out the new Channeler class and new dragon-themed Alternative Advancement (AA) systems for each archetype. We’d love your feedback on these features, as well as other parts of the expansion! Beta will last until the launch of Tears of Veeshan onTuesday, November 12, 2013! You can click the ‘Beta Copy’ button on the character create screen to copy the currently selected character. You can log in your character and then use the /beta command. Beta installs into a subfolder that requires about the same amount of space your live install takes. Remember to set the ‘Version’ back to your regular setting to get back onto your normal servers. The Beta server may not be accessible at all times. This server is wiped periodically, meaning beta characters may be deleted with or without notice. Have you pre-ordered yet? Don’t miss your chance to get a discounted Collector’s Edition and an item exclusive to players that pre-order, the Veeshan Loyalty Cloak. Pre-order EverQuest II: Tears of Veeshan here. Beta Copy Note: Once Beta Copies are enabled for Tears of Veeshan beta, you will be able to copy your character over to Beta in just 10-15 seconds (not hours or days) by typing /beta on your live character. Guilds are not copied over. 1. 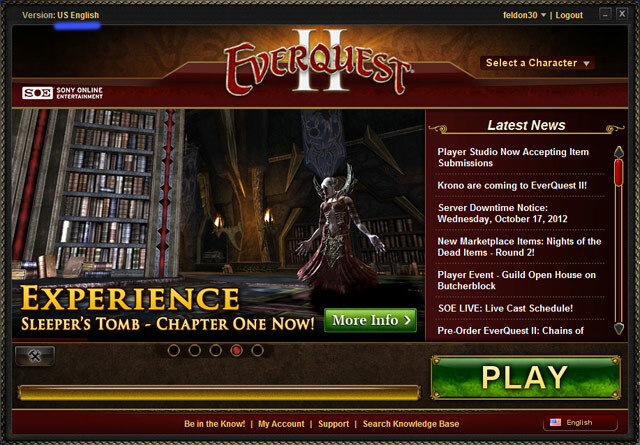 If your EverQuest II launcher is running, close and reopen it. 2. Click the Version link in the top left corrner (US English for US players). Change the Game Version to “Beta” and click “Apply”. 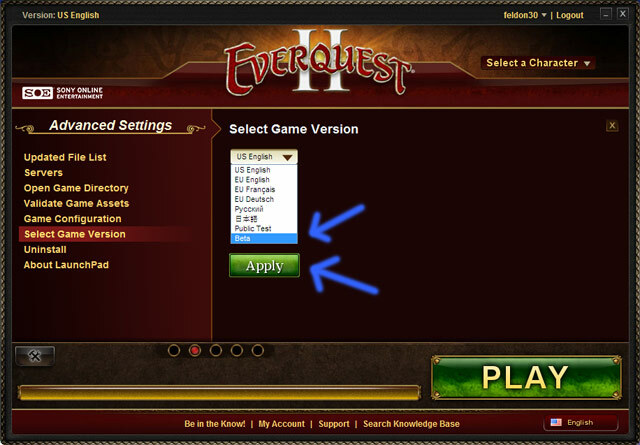 If that sounds like a bad idea to you, then locate your EverQuest II folder (you can click the “Open Game Directory” button in the Launcher). REGULAR: Ctrl-click on your music and paks folders, and then Ctrl-drag (Copy not Move) them to the new BetaServer folder. This will shave your patching time down to about 15-20 minutes. 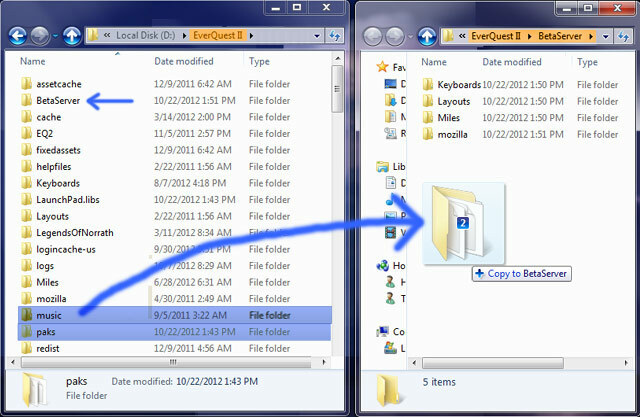 STREAMING: Ctrl-click on your assetcache folder, and then Ctrl-drag (Copy not Move) it to the new BetaServer folder. This will shave your patching time down to about 15-20 minutes. 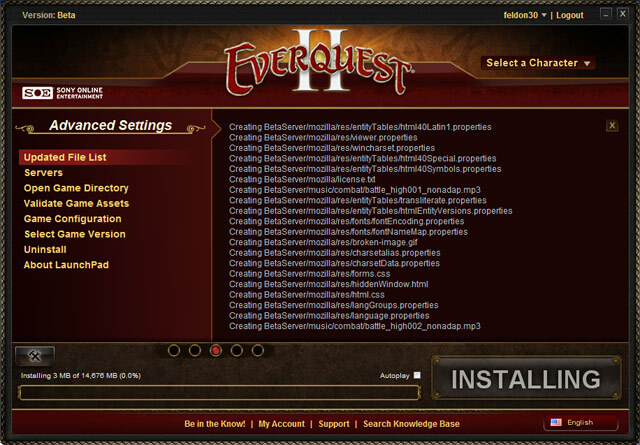 CAUTION: Do not copy the entire EverQuest II folder into your BetaServer folder. There are a number of UI changes in Tears of Veeshan (the devs really do try to keep this to a minimum!) For now, you will want to use the default UI until mod authors of ProfitUI, Drums, Fetish, and so on can update their scripts. NOTE: You do not need to open the two windows side-by-side as I have done them above. You can just ctrl-drag the two folder(s) into the BetaServer folder all in one window. You should feel confident clicking “Replace” wherever necessary to overwrite any files which may already be present. Once the copy is complete, switch back to the Launcher and wait 15-20 minutes for patching to complete. You should then be able to Play!! NOTE: Another issue people are having with crashes can be fixed by deleting your EverQuest II\Launchpad.libs file. NOTE: If EQ2 Beta crashes immediately after launching, download these DirectX 9 executable files to your BetaServer folder. Where are the Beta Forums? When the Tears of Veeshan Beta forums have been setup, we’ll provide a link to them. It’s not unusual that beta wouldn’t start til 2pm PDT.